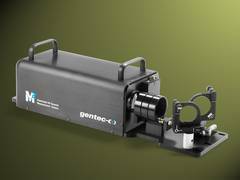 With the Beamage-M2, Gentec-EO has now introduced an automated system that can ­determine the quality of a laser beam in only 20 to 60 seconds by means of an M2 measurement. Available exclusively from LASER COMPONENTS, this system is the only one in the world with a complete set of 50 mm optics. This allows measurements to be made on larger beam diameters and divergence angles. The detector is a particularly large CMOS sensor chip (11.3 x 11.3 mm) with a resolution of 4.2 megapixels. All measurements comply with ISO11146 and ISO13694. With its handy design, the Beamage-M2 can be easily mounted on optical tables. This makes it ideal for use in R&D laboratories. Automatic and manual measurements are ­possible via user-friendly software.